Pentel GraphGear 500 0.7 Mechanical Drafting Pencil - GraphGear 500 Mechanical Drafting Pencil features a 4mm fixed sleeve for template work and technical drawings. Metallic-mesh grip delivers precision and control. The barrel is weighted at your fingertips for precise drafting and template work. Easily identify your lead type with the built-in lead hardness indicator. Preloaded with Pentel Super Hi-Polymer HB lead, the pencil never needs sharpening, is super-strong and produces a dark line. 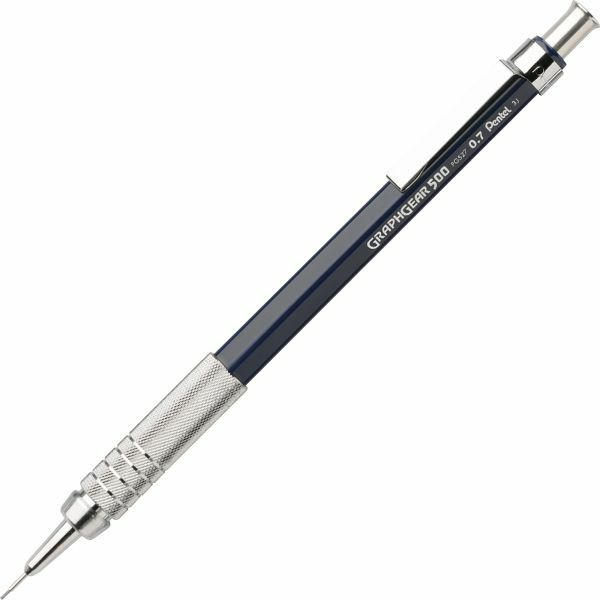 Drafting pencil offers a top click, stationary eraser and tip. Refill with Pentel Super Hi-Polymer Lead and Z21 refill eraser.